As you decide what you want to manifest, it is time to letting go of limitations you don't want to take with you. You're not just throwing out anything that doesn't serve you. You're harnessing the energy of your dreams to accelerate the Law of Attraction. This powerful step is essential to creating your most incredible year. 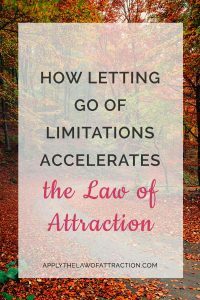 Letting go of limitations cleans out all the internal gunk that holds you back from effortless manifestation. In Step 1, we covered knowing what you want to manifest with complete clarity. Now we look at the hurdles in your life, the problems, and all the things you have attracted that you just don't want anymore. These are all limitations. 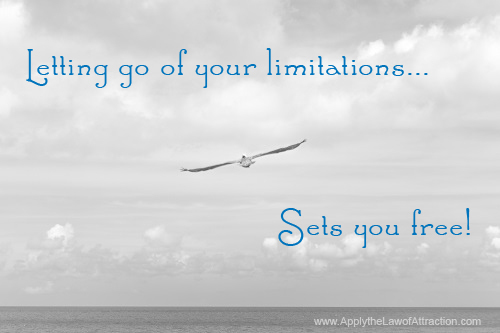 It's time to let go of your limitations! Normally, when people focus on letting go of the stuff that is limiting them or holding them down, they look at the world around them. They might ask themselves, “Who or what is causing me to have negative thoughts, anger, fear, doubt, worry, frustration, pain, or sadness?” They then try to get rid of it or change it so that it suits them better. This is the wrong approach to letting go of your limitations! It doesn't solve the problem and can make things worse. Nothing outside of you can cause you to feel a certain way! Anything outside of you is only a result of what you have created. Everything begins and ends with you. 1. “Where do I have unmet needs?” An unmet need exists when you think something or someone can make you feel better. For example, an unmet need occurs when you believe you would feel better if your father would tell you he is proud of you. 2. “What are my hidden agendas?” A hidden agenda exists when you do something thinking that you'll get something else in return. An example is the belief that winning the lottery will give you security. Really take the time to answer these questions as thoroughly as you can. You will gain a lot of insight into yourself, your life, your limitations, and what you want to create. Once you have your answers, look at the list you created in Step 1. Focus in on the feelings you stated that you want each desire to give you. The feelings are what you want to create. Those feelings, along with what you uncovered by answering the questions above, are what you want to concentrate on to create your most incredible year. When you engage those feelings and become one with them, you will find yourself letting go of limitations naturally. Limitations will fall away easily as they are replaced by you consciously having your desires. What Happens After Your Desire Manifests? Happy New Year! Wishing you many blessings in this new year!!!! I love your website! It has become my daily inspirational source. It helps a great deal! Thank you for taking the time to keep it updated and fun and uplifting. One question about attracting a specific person… I am trying to re-attract my ex! We broke up a few months ago after several years of being together. The whole thing was extremely painful on my end. Right now I am fighting resistance and limitations. I am working on letting go of the longing and missing him. I was listening to a video from Abraham Hicks where they mention finding “relief” when we think of a situation or someone. Basically we can think about the person as much as we want AS LONG as it feels good! And that’s my challenge right now! It’s been difficult to think of him without fear, jealousy that he might find someone else, or breaking down in tears. It is getting better, but I am not there yet. I wanted to know if the only thing that feels good right now and that makes me laught when I think of him is the moments when we both had fun weird moments together, or when we would both have laughing fits. When I think of that, I can’t help but smile or even laugh. Is that a good thing? Does that elevate my vibration and would that work at attracting him back? If I only concentrate on those things, because they are the only things that don’t make me feel sad about him, is it alright, or thinking about our past relationship blocks the way for a new one? Also what exactly is Remote Seduction (heard lots about it) and how does it work? Does it work better than other methods? Thanks Elizabeht. Looking forward to hearing from you, if you have a few minutes. I know you get a lot of questions. If it elevates your vibration, then it’s fine to continue it. The key is to focus on things that make you feel good, not on things that make you feel bad. Remote seduction isn’t a technique that I recommend. It involves too much mind energy and can be very temporary. Manifestations from the heart last longer which is why I cover heart energy so much in my books. Shasha – I know how hard what you’re going through is. You should reread this post and answer the questions. I think they’ll help you a lot. Don’t worry about what went wrong. Nothing went wrong. It’s in the past and the past can’t be changed. It’s time to focus on what you want and the future for you and your children. Think about what you want to do next. Do you really want to be with this man or do you deserve someone better who actually realizes how amazing you are? Would you be happier being single than being with someone who is out with other women and doesn’t give a fig about you? Is he sleeping with these women and putting you at risk of STDs if you stay with him? If you want this man, I’d say read Elizabeth’s book on how to create the relationship you want with a specific person. Otherwise, kick this man to the curb and find someone who knows you’re wonderful and doesn’t want to risk losing by treating you as poorly as your current man.